Are you looking for something a little different to boost your running fitness? Perhaps you are injured, or prone to injury, and want to enjoy all the benefits of running without the impact on your legs? Maybe you are not a runner at all but want to enjoy a water-based workout? Then aqua running could be the class for you! 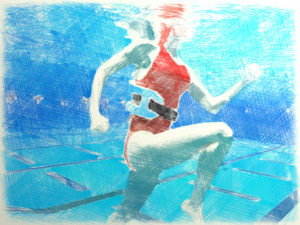 Aqua running is simply running in water. It's done in the deep end of a swimming pool, so there is no impact at all from the ground on your legs; you wear a special flotation belt to keep you upright. You then 'run' in the water, just like you would on land. It's hard work, so best done in a structured class with a coach who can keep you motivated and help you develop good technique. Everything you do in the class will help your running on dry land too! Mud and miles weekly aqua running classes at Newark Sports and Fitness Centre are a maximum of 45 minutes long (8.15 to 9.00pm) and comprise of a warm-up, some technique work, a main activity designed to improve your fitness, and a cool-down to finish off. (Please note that this is a private class and is not included within Newark Sports and Fitness Centre timetable or memberships). (Complimentary taster sessions will only be available when there is space in the class). Book your COMPLIMENTARY taster session now!